Juice Plus+ Plant Based Vegan Omega Capsules! Introducing the New Juice Plus+ Omega Blend with Vegan Capsules. The first Plant Based Omega’s with 3-5-6-7-9! The Vegan Friendly Plant Based Omega Capsules • We Bypass the fish! 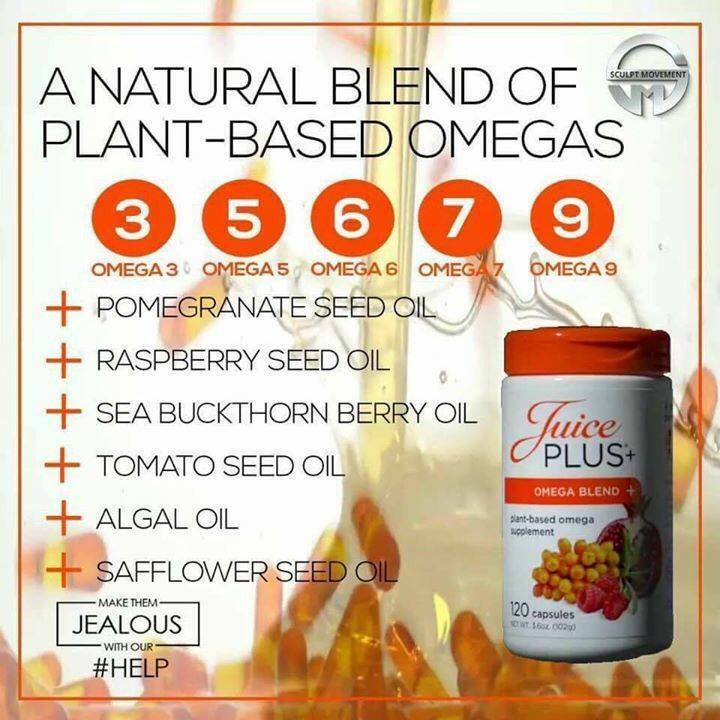 Juice Plus+ Omega Blend is a naturally balanced blend of plant‐based oils containing Omega 3, 5, 6, 7, and 9 fatty acids in convenient capsule form. We encapsulate oils from six different whole food sources: algae, pomegranate seeds, sea buckthorn berries, raspberry seeds, tomato seeds, and safflower seeds. 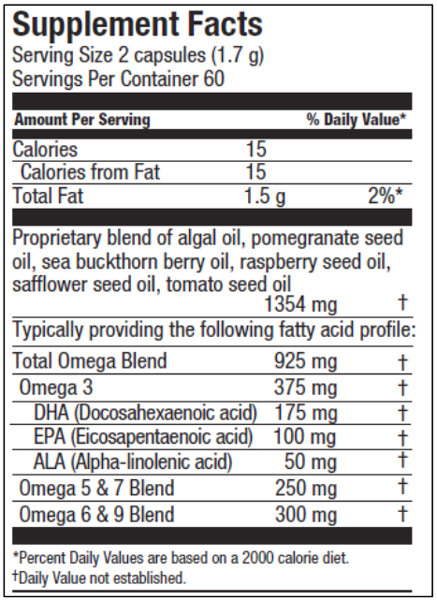 We cut out the middle fish by taking our Omega 3’s from the original algal source that the fish eat, not from the fish. This provides a purer more sustainable source of Omega 3’s from algal oil. 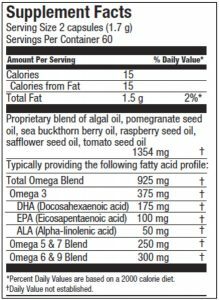 We also add oils from the berries and seeds of five other plants to round out the product’s Omega profile by providing a broad array of omega fatty acids in 3, 5, 6, 7 and 9. This creates a balance as it would naturally occur in nature. We then cold press these oils to ensure minimal impact on their nutritional quality and integrity. We encapsulate these oils in a vegetarian capsule made from tapioca. The two halves of this capsule are fused together using a new, state‐of‐the‐art encapsulation process that avoids the need for higher temperatures that can negatively impact the nutritional value inside. contains no artificial colors, flavors, preservatives, or added starch. 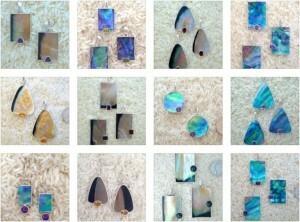 are NSF and Kosher certified. 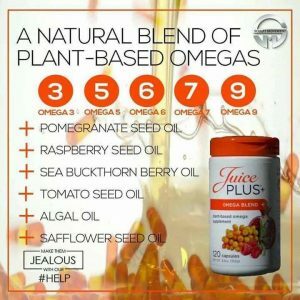 Juice Plus+ Naturally Balanced plant‐based Omega Blend Capsules. 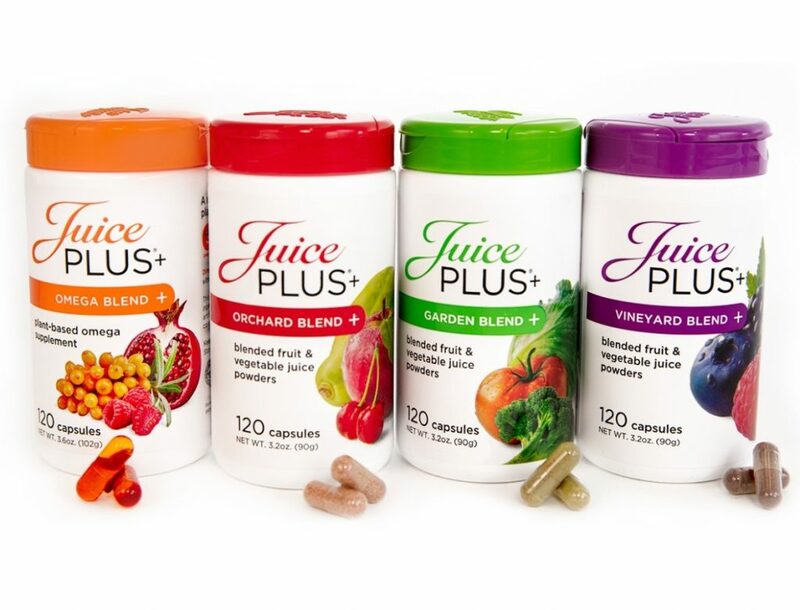 The Juice Plus+ Omega Blend complements our Orchard, Garden, and Vineyard blends. 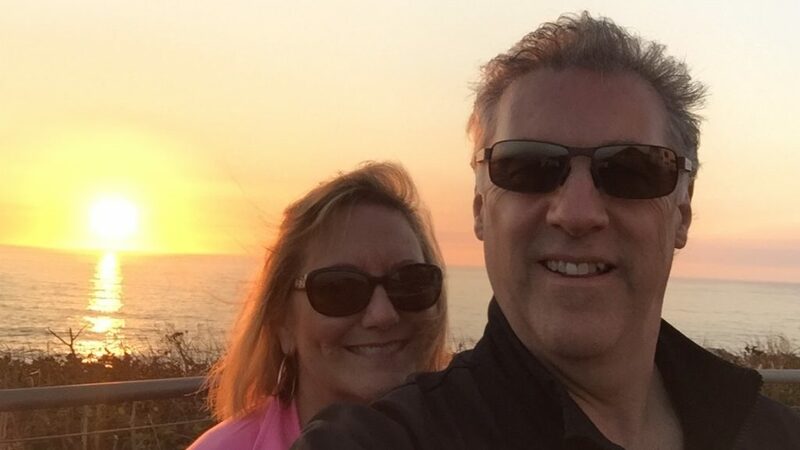 We’ve learned that the #1 supplement that our customers take in addition to Juice Plus+ Orchard, Garden, and Vineyard is an omega fatty acid supplement of some kind, usually containing only omega 3’s. Juice Plus+ Omega Blend takes omega supplements to a whole new whole food level. Our omega product is a naturally balanced plant‐based blend of omega fatty acids, not just Omega 3, but also Omega’s 5, 6, 7 and 9. We don’t extract our omegas from fish sources, as most other supplements do, we use the original source, algae, instead. We also include cold‐pressed oils from five other seeds and berries in which omega fatty acids naturally occur. We all need to eat better and we especially need more nutrition from fruits and vegetables in our diets everyday and this includes omega fatty acids. Our Juice Plus+ Trio help you Bridge the Gap® between what you should eat and actually do eat every day with antioxidants and other micronutrients from fruits and vegetables. 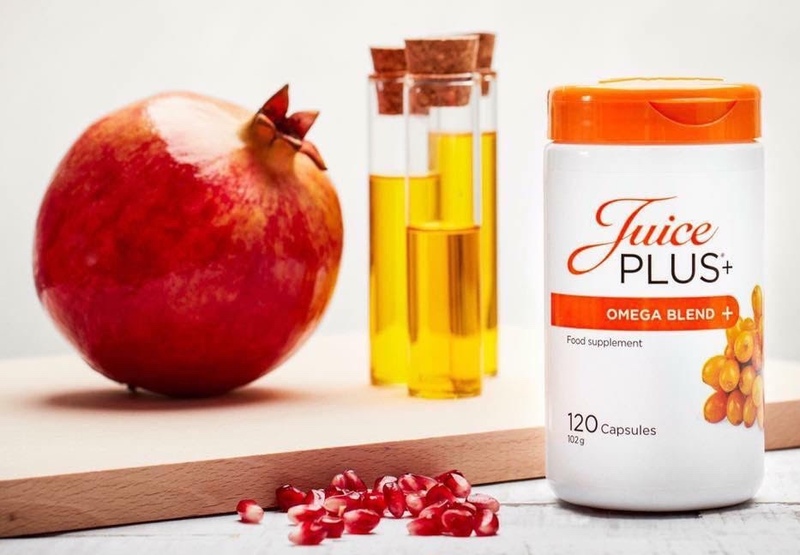 Juice Plus+ Omega Blend helps you Bridge the Gap® between the omega fatty acids you should be getting from your diet and the omegas you are actually getting everyday. Why Juice Plus+ Omega Blend capsules? An omega fatty acid supplement is the #1 supplement that Juice Plus+ customers take in addition to their Juice Plus+ Trio capsules or chewables. There is large and growing scientific evidence that a diet rich in omega fatty acids supports a broad array of health benefits, including heart, brain, joints, skin, and eyes. Like most diet‐related phenomenon the reality is that people can’t, won’t or don’t get enough omegas in their diet, especially from high quality plant sources. Like our foundational fruit, vegetable, and berry blend products, Juice Plus+ Omega Blend Bridges the Gap between what people should eat, and what they actually do eat everyday. Capsule: Vegetarian two‐piece capsule. Size “00” ‐ same size as all other Juice Plus+ capsules. Capsule count: 120 per bottle. Recommended daily consumption: 2 capsules per day. Carton configuration: 2 bottles per carton, like our Vineyard Blend (4‐month supply). Why a Supplement Label instead of a Nutrition label panel? Because of the nature of the product and its focus on providing specific nutrients from Omega fatty acids, a Nutrition Facts label would be completely useless while showing little more than a series of zeros. Providing a Supplement Label also makes it easier to compare with other omega supplements. Help fight depression, anxiety and other mental health issues. Help reduce heart disease risk and ADHD symptoms. Aid in fighting autoimmune disease, Alzheimers and age-related mental decline and cancer. Help improve joint, bone and skin health.